When the BMW i8 was unveiled, it brought with it a suite of state-of-the-art technologies. Now these features are making their way into the full lineup of BMW vehicles, and here are a few of our current favorites. Adaptive LED headlights turn as the steering wheel turns, delivering optimum road illumination in all conditions. Not only does LED lighting make traffic signs and other objects easier to see, it also reduces eye fatigue when you’re out on a long night drive. Full-color head-up display keeps your eyes on the road ahead, displaying essential information such as current speed and navigation onto the windshield in front of you. It can even show you radio stations and music tracks, so you’ll know when your favorite song is coming up. Surround view camera system offers a 360-degree view of your surroundings, thanks to cameras that are built into the vehicle’s front, sides and rear. Blind spots are a thing of the past, since the system displays approaching vehicles on the Control Display, and there are interactive track lines to help guide you when steering into a parallel parking space. Night vision. BMW Night Vision allows you see up to 900 feet in the dark. If it detects something looming in the shadows, it will shine a spotlight to keep everyone safe. 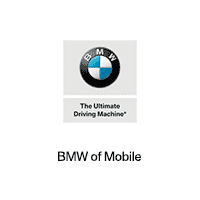 Contact BMW of Mobile to speak with a member of our team and learn more about the newest developments from BMW.